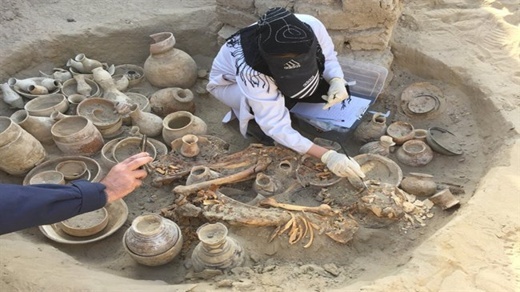 An ancient grave of a 40-year old wealthy woman, containing 112 artifacts, has been discovered in the Burnt City (Shahr-e Soukhteh) site in the southeastern province of Sistan-Baluchestan. With the discovery of the grave, which dates back to 4,600 years, the archeologists have managed to register a new record in the history of their excavations. Mansour Seyyed Sajjadi, head of the Burnt City’s Excavation Team, said three types of graves have so far been found in the Burnt City including simple ditches, ditches with two sections and burial crypts. He added it is the second time that a grave, with 112 ancient items, has been discovered at the Burnt City site. “A grave of 32- year-old man and his 10-year-old child, containing 112 relics, was discovered in the Burnt City in 1998,” he said. He said archeologists have discovered only two burial crypts during the 15th excavation season in the ancient city. Seyyed Sajjadi noted that archeologists and genetic specialists have conducted extensive studies on the ancient graves, the skeletons and the relics found in them. “Genetic specialists, speculated that the skeleton unearthed from one grave belonged to a woman whose height was 155cm ,” he said, adding a number of containers resembling collyrium box, colorful jars and pieces of textile materials have been found near the skeleton. Seyyed Sajjadi said salt and minerals available in the soil of Burnt City made the textile durable for such a long time. Prior to the excavations by Iranian archeologists at the Burnt City site, an Italian team had come across 220 graves in the location.